How to stream with Epiphan Encoder. To start you will have to login as admin to your Epiphan interface, from there go to "Publish Stream" section and click on "Publish". Choose RTMP push from the drop down menu. Please make sure that you have also entered your username and password for the stream. After you have entered the information in the "Publish stream" field, you check your connection from the "Connections" tab. 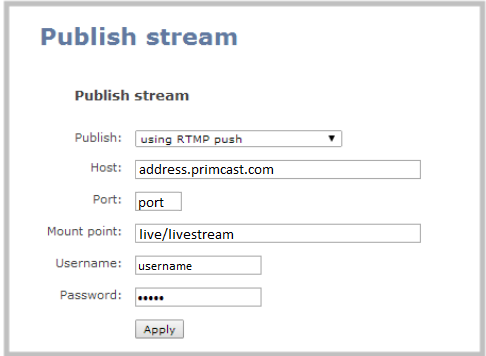 The stream will be shown as rtmp.publish in your encoder console connections window.